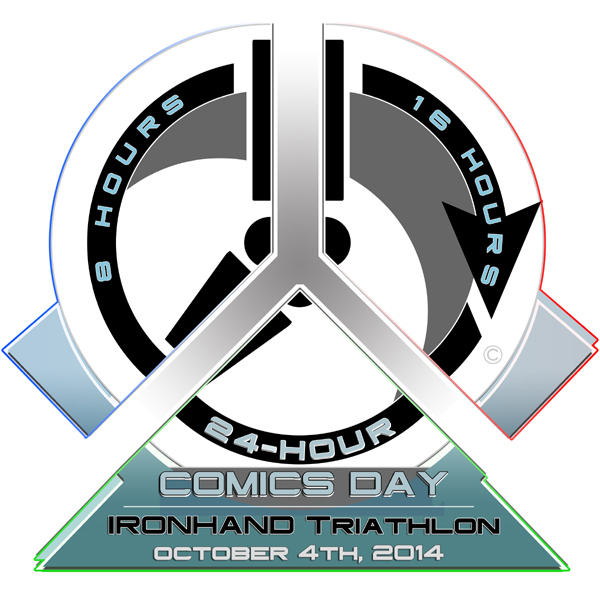 ComicsPRO and Official 24HCD endorses this new 24HCD event. The official IRONHAND Triathlon "Finishers Award"
The Finisher's Award split into 3 parts..
After 10 years of of challenging artists and creators all over the world to create comics, this yearly event has finally evolved. We were inspired by the conversations at our panel during Comic-Con San Diego 2014 and we needed to do something that would encourage more participation this year. And we teamed up with Comic-Con/APE to bring it to Northern California for the first time. Plus this time we're getting some strong marketing from the official organizing bodies involved! Exciting times! Read the official program description below for details about the new #IronHand24HCD event at APE, the Alternative Press Expo. Artists, writers, and curiosity seekers are invited to participate in this brand new evolution of the original 24-Hour Comics Day Challenge www.24hourcomicsday.com, which is a world-wide, yearly event with a simple goal: Create a 24 page comic in 24 consecutive hours. 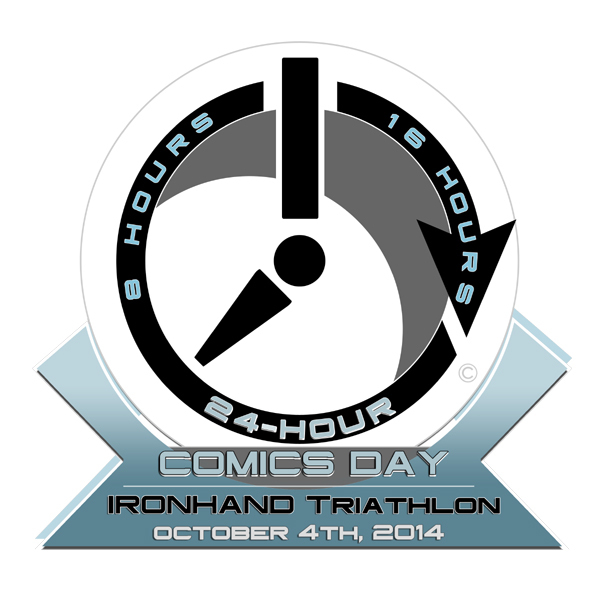 The 24HCD - IRONHAND Triathlon breaks the 24 hours into 3 separate shifts. After each shift the artist can earn 1/3 of the special "Finishers Award". When an artist completes 8 hours they earn and keep the "8 hour" piece. When they complete 16 hours, they earn and keep the "16 hour" piece. Then finally, at 24 hours, they receive the final piece and complete their award and the challenge! If you are interested in joining us, please email contact@blitzcomics.com. You are also welcome to join in even if you only want to draw for a short amount of time or if you want to find out more about the event. Sponsored by ComicsPRO, the Trade Organization for Comic Book Retailers and Blitz Comics. (Note: The first eight hours will be at APE, the remaining 16 hours will be offsite).